BOO!!! Did I scare you?? Happy Halloween everyone. I don't get any beggars out here in the country. It is my only complaint about living here. I miss all those little ghosts and goblins. I hope the weather is decent for them tonight. I'll tell you what scares me. The fact that it is already the beginning of November. Aaargh, where does the time go? I have to start thinking about Christmas shopping, decorating for Thanksgiving, decorating for Christmas, planning parties and meals and my calendar is filling up ultra fast. That is what is scaring me today. We are doing yard work today and then having a date night tonight since we get no little visitors anyway. Tomorrow we are taking dinner over to Frank's Aunt Irene's house. Regular readers of my blog know her as Ciocia. We will have dinner and play some pinochle. It has been too long since we have been to visit with her. The rest of the week is pretty quiet so I am going to use it to start preparing for the upcoming holiday season because the holidays are going to come, ready or not. In the meanwhile, we still have to eat so here is our weekly menu. It is roundup time at the Book Club Cookbook Cooking Crew. The Book Club Cookbook CC was started by Cam of Culinary Adventures with Camilla. You can find out all about it at her announcement post. This month was my turn to choose the book from which we would be inspired to cook and I chose Three Junes by Julia Glass. I want to start off this post apologizing to those of you, who like me, threw this book across the room with a curse word when it ended. It started off good. I loved Part 1 with Paul in Greece, working through his grief and making new friends. I understood how difficult it was for him to lose his life's partner that he stuck with through good times and bad. I understood how he needed to get away and reconcile with the fact that he was alone and his boys, especially his eldest, and he did not see eye to eye. I liked the Part 2 where we got to know the eldest son, Fenno, and his brother's and their wives a little better. I liked how the family dynamics are seen so differently by each. I found that to be very realistic. I started off liking Part 3 and then it just went south on me and the next thing I knew it ended. Just ended. No conclusion. No end of story line. It was like the author got sick of the story and set it down and walked away. What the heck!!! Okay, enough bellyaching, I decided my favorite part of the book was Paul's time in Greece so I decided to go with a Greek dish. I am anxious to see if others reacted to this novel as I did and to see what they were inspired to make. Let's take a look. 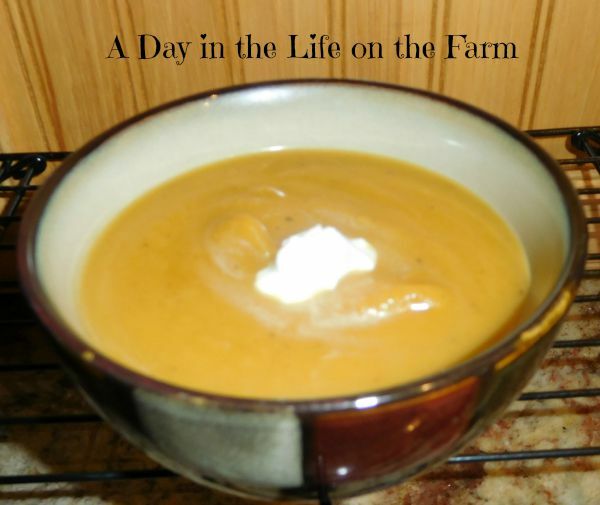 Our fearless leader, Camilla of Culinary Adventures with Camilla, was the first to submit her post for this month. 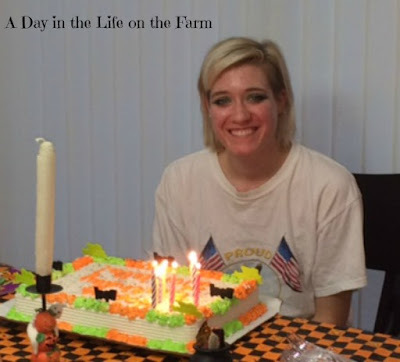 Cam is still unsure of whether she enjoyed my selection but she was inspired to make several dishes including a beautiful quince dessert that reminded her of sunsets. In the end she decide to submit the Book Club Cookbook's selection of White Chocolate Mousse because "a dessert worthy of the Greek gods. Yep. I had to do it". Thanks Cam for starting this club and for sharing all of your inspirations. The next submission came from Sarah of The Pajama Chef who was inspired to make Beef Stroganoff because of all the meals around which family gathered. 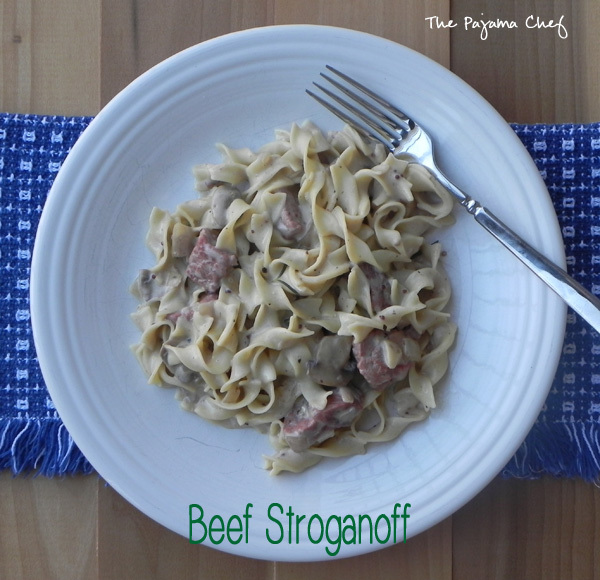 Sarah said "When I think of family meals, beef stroganoff is on of THE meals that come to mind". I have to say that her recipe certainly looks incredible and I can see why it holds such a place in her memory and heart. Next up is Erin of The Spiffy Cookie. Erin made an absolutely decadent looking White Chocolate Peanut Butter Mousse, using white chocolate flavored peanut butter. I have never heard of white chocolate peanut butter but you can be sure that I am keeping my eyes peeled for it the next time I am at the grocers! 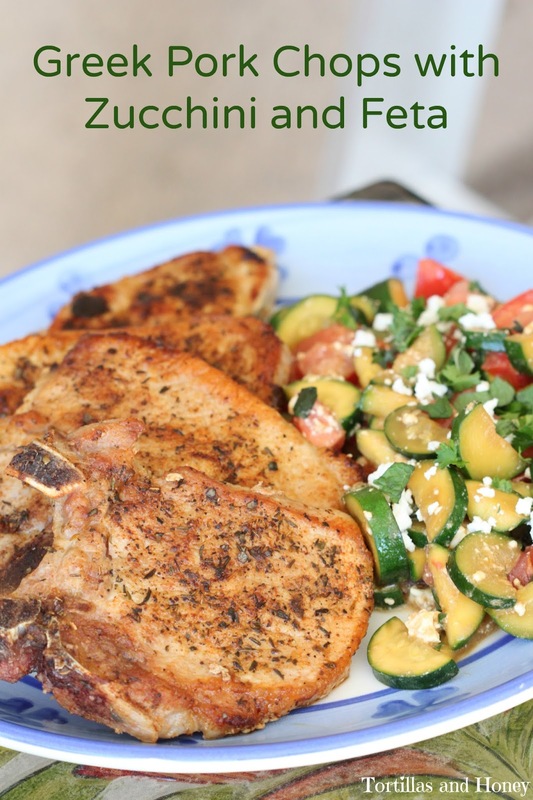 Renee of Tortillas and Honey decided to share Greek Pork Chops with Zucchini and Feta , inspired by the first of the three books but more so by the ease of preparation and the great taste of this dish that she loves. Renee reiterated this "I'll say it again, this is one of my favorite meals, and I'm so excited to share this with you today!". I'm excited you shared it too, Renee, thanks. Let's go over and visit with Ashley of Cheese Curd in Paradise. Ashley didn't have an opportunity to read this month's selection so she went with the White Chocolate Mousse inspiration from the cookbook. Ashley made this her own by turning them into Adorable White Chocolate Mousse Ghosts. Renee of Adventures in All Things Food joined us this month sharing her version of White Chocolate Mousse. Renee's husband is a purist and loves white chocolate even though Renee prefers milk chocolate so they compromised. Renee says "I decided to do the noble thing and keep the white chocolate mousse, but I spiked it with my favorite flavor-Kahlua!". Take a look at how great Renee's White Chocolate Kahlua Mousse sounds! Last but not least, here is the recipe I decided to share. Last year I won a great cookbook, It's all Greek to Me. I have shared several meals from it like olokliri-kota-sti-skara, soutzoukakia, baklava and spanakopita. All of these dishes turned out marvelous so I was sure that this pie inspired by Three Junes would as well. 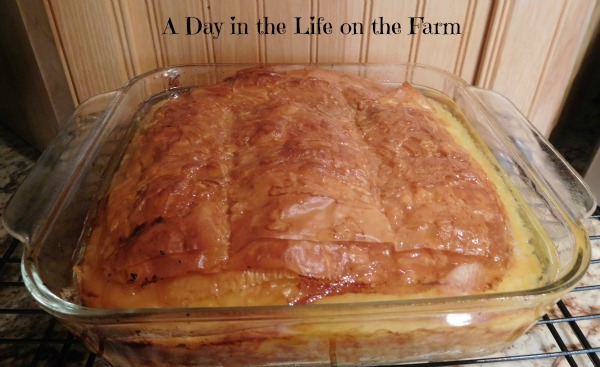 I was looking for a recipe and had thought I would like to make rice pudding but then I came across this recipe and remembered the last section of the book (before I hated it) when Fern prepared her specialty, pies for Tony, Fenno and Dennis. I decided I would combine these and make a Classic Phyllo Custard Pie. I reduced the recipe as I had no need for sixteen to twenty pieces of pie from a 9x13 pan and used an 8x8 pan instead. In a medium sauce pan over med high heat bring milk to a simmer, being careful not to boil. When milk is hot add the flour, cook and stir constantly until mixture thickens. Add vanilla, cook and stir one minute longer. Remove from heat and set aside. In the bowl of a stand mixer, using the whisk attachment, combine the eggs and sugar, slowly add a 1/2 cup of the custard to the egg mixture, whisking continually. Add the tempered egg mixture to the pan of custard whisking vigorously to prevent scrambling. Set aside, stirring occasionally to prevent skin from forming. Place the phyllo dough out flat on a counter, covering to prevent the dough from drying. 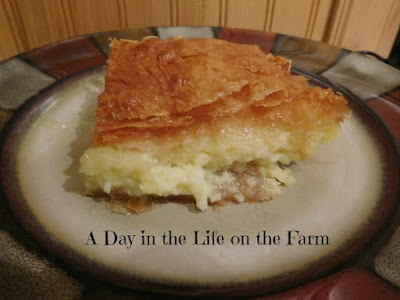 Double 1 phyllo sheet and place in the bottom of an 8x8 pan that has been treated with baking spray, brush with melted butter, add another folded layer, brush with butter, continue in this manner until half of the phyllo sheets are used. Pour the custard over the phyllo sheets and top with the remaining phyllo sheets in the same manner as before. Brush the final layer liberally with any remaining butter and sprinkle with 2 t. of water. With a very sharp knife, score the top few layers of the phyllo into 9 pieces taking care not to cut all the way into the custard. Bake in a preheated 350* oven for 50-60 minutes or until flaky and golden brown. While the pie is baking make a simple syrup by placing the sugar and water into a medium saucepan with the lemon peel. Stir over medium high heat to bring to a boil and cook for 5 minutes. Remove from heat and stir in the juice of half a lemon. Set aside to come to room temperature while the pie finishes baking. Make sure you join us next month as Erin from The Spiffy Cookie hosts Harry Potter and the Sorcerer's Stone by J K Rowling. I can't wait!! The other day I made White Chicken Chili for dinner and had intended on serving corn bread along with it but my hens are molting right now and I am not getting any eggs. It is hard to make corn bread without eggs. I didn't have time to make a yeast bread so I thought I would make biscuits instead. I started to put the cornmeal away when I thought to mix some in with the flour for my biscuits. Then I decided to add some cheese as well because when I made these mini cheddar biscuits they were a huge hit. I was very pleased with how well these turned out. They were buttery and rich but still light and fluffy. I made drop biscuits but you could roll them and cut them if you want a more traditional look. This recipe only makes 6 biscuits but feel free to double it. The biscuits freeze well and are also good for breakfast the next day. We were scheduled to have Cheeseburger Pizza for dinner last night, but I left early and was gone all day and had forgotten to take out the hamburger. I had also had a late lunch with Mom Klik and Amy after bingo. Mom Klik's treat since she was the big winner of the three of us. I walked in the door and was thinking that I would love to take a nap and perhaps we would order pizza in tonight instead. Then Frank said "take a look at your dogs out there". There they were all 3 of them next to the pond. All you could see were their butts sticking up in the air because their heads were buried in a muskrat hole and they were busy hunting. So much for a nap. 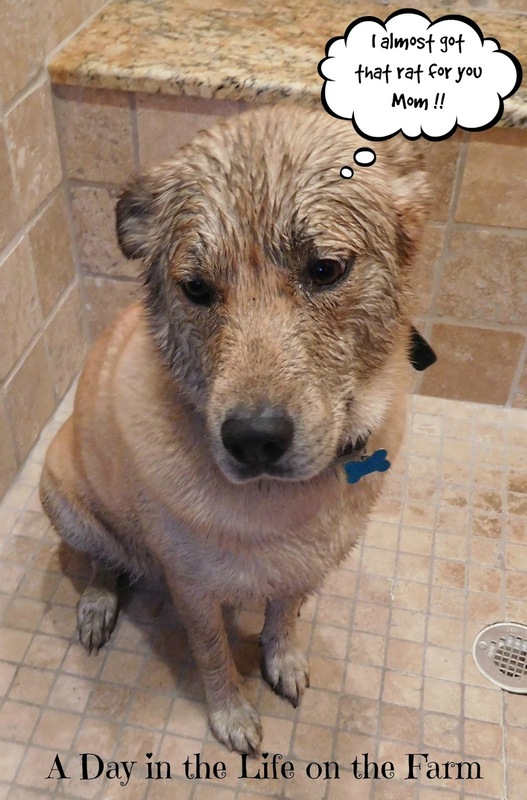 We called them each in, one at a time, and gave them all baths. One at a time so that the other 2 didn't get the house filthy waiting their turn. 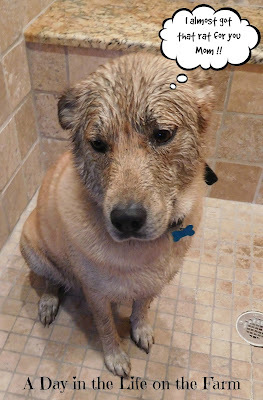 The puppies are getting much better about their baths now and while they don't get excited about it, they no longer try to escape during it. Once their showers were over and I thought about dinner again I figured I may as well make the pizza. It wouldn't take much longer than delivery and it would taste much better and cost much less. I had half a jar of marinara left from the eggplant rollatini that I needed to use and an unopened package of pepperoni in the refrigerator so it was silly not to make my own especially with this easy weeknight pizza dough recipe that I am going to share with you. 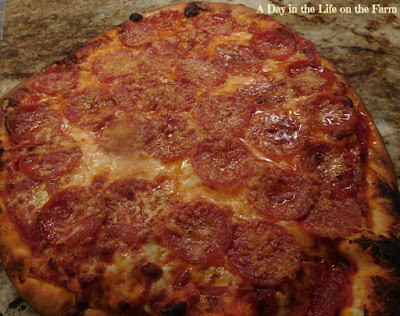 The entire process from starting the dough to eating the pizza only takes an hour and a half. Very doable, even for the busiest of days. You can use any toppings you have on hand for this pizza or you can make four 7" pizzas and let everyone choose their own toppings. 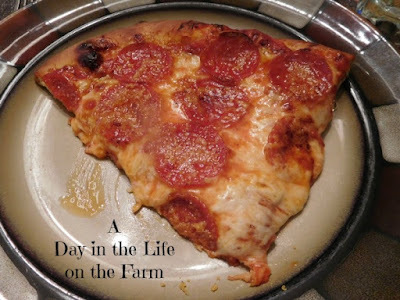 Last night ours was just a plain cheese and pepperoni pizza because that was what I had available and I was lazy. My recipe for pepperoni pizza follows the dough recipe. Enjoy! Combine water, yeast and honey in a small bowl and let set until foamy, about 5 minutes. Bring a large pot of water to a boil. Whisk the flours and salt together in the large bowl of a stand mixer. Add the oil and yeast mixture. Mix on low speed, using the dough hook, for 7-10 minutes, until the dough is smooth and springs back when touched. Form dough into a ball, spray bowl with cooking spray or olive oil and return dough ball to bowl. Place bowl in a cold oven with the pot of boiling water next to it. Close the door and let rise until double in size, about an hour. Place a pizza stone in a cold oven on the lowest rack and preheat to 500*. Place the rolled pizza dough onto a pizza peel or baking sheet that has been sprinkled with cornmeal. We had a great weekend but I have been so busy that I haven't been able to share it with you. 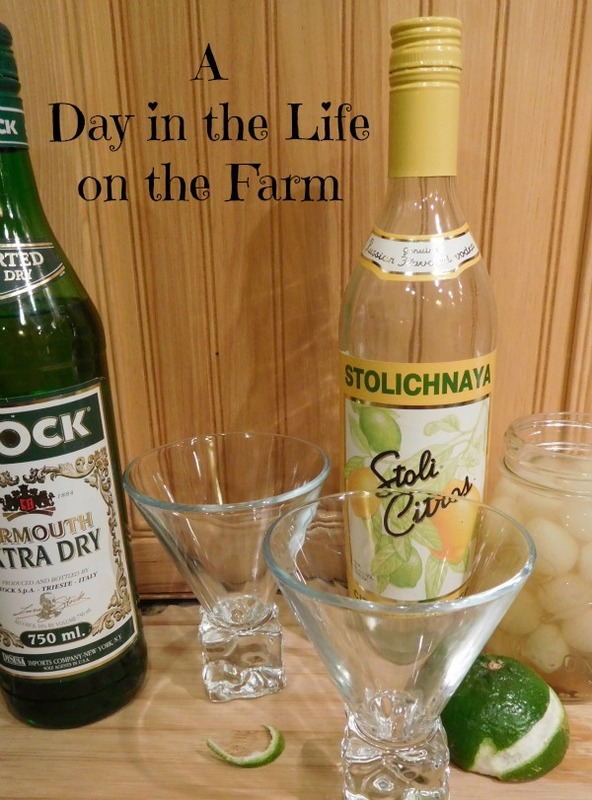 It started off with an impromptu date night on Friday that I told you about in this post where I shared a new cocktail creation that Frank made for me. What I didn't tell you is that while we were out Frank also took me to a furniture store to see if we could find something we liked to replace our living rooms furniture. We did find things we liked but before we could make a final decision we had to leave to make our dinner reservations. 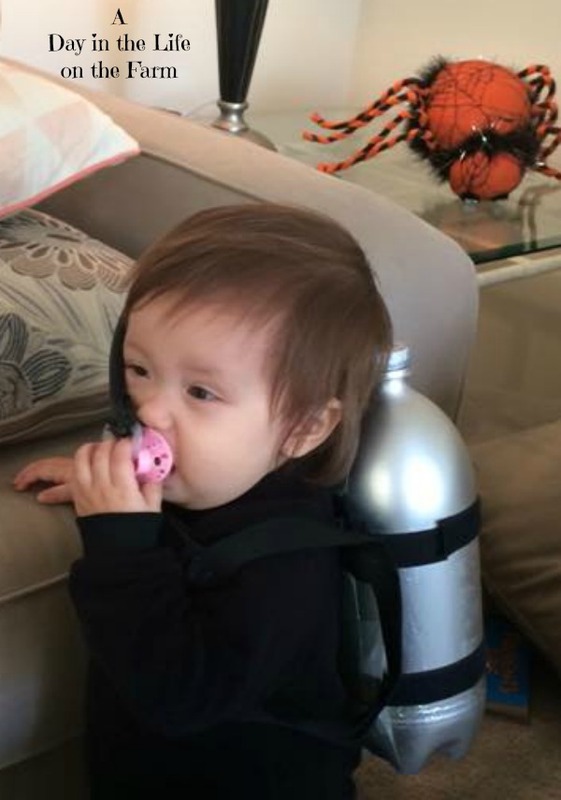 On Saturday we got up early and went to Tingting's to help her put together a bookcase that she bought and Frank helped with Melody's costume for the Zoo Boo that night. After that Frank took me back to the furniture store and we ordered up a new sofa, chair and ottoman. It will be delivered in 4-6 weeks. Then we went to celebrated Danielle's birthday. Sunday morning we sang at 9:30 Mass. When we got home, Frank made some oatmeal and I made a caramel apple topping for it....Delicious!!! I will be sharing that with you today. Sunday afternoon we went to see Dirty Dancing, the Musical. It was awesome and I would go see it again, given the opportunity. Following the show we went out for dinner. It was a great night. Yesterday I got my hair cut and ran some errands. Frank and I went for a 2 1/2 mile walk before dinner and then relaxed with the Halloween segment of DWTS. Today I met a friend and her family for lunch, after which I went to the feed store and grocery store. Frank picked Melody up on his way home. 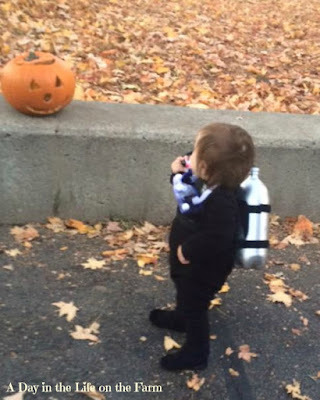 She and her Mom had spent the morning at the library Halloween party. 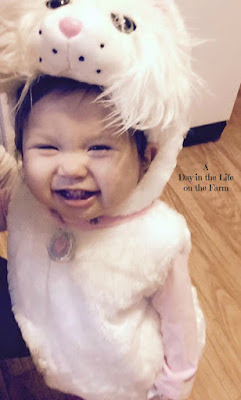 Melody was a cat today....a birthday gift from her Aunt Linda Benda. Tomorrow I am taking Mom Klik to Bingo, after which I will stop in and spend some time with my Mom before coming home to start dinner. It was supposed to be a quiet week but you know how that goes. 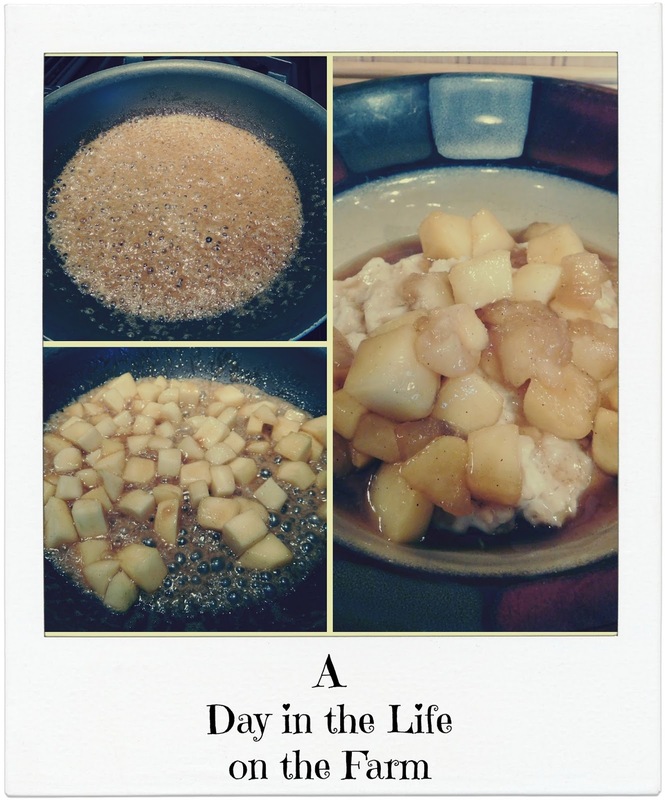 Here is the recipe for Caramel Apple Oatmeal. DELICIOUS!!!! Old Fashioned Oats made per package directions using milk instead of water. A lovely little onion in a citrusy martini. In an effort to make all of her holiday gifts this year my friend, Camilla at Culinary Adventures with Camilla invited some of her favorite foodie bloggers (including me!!) 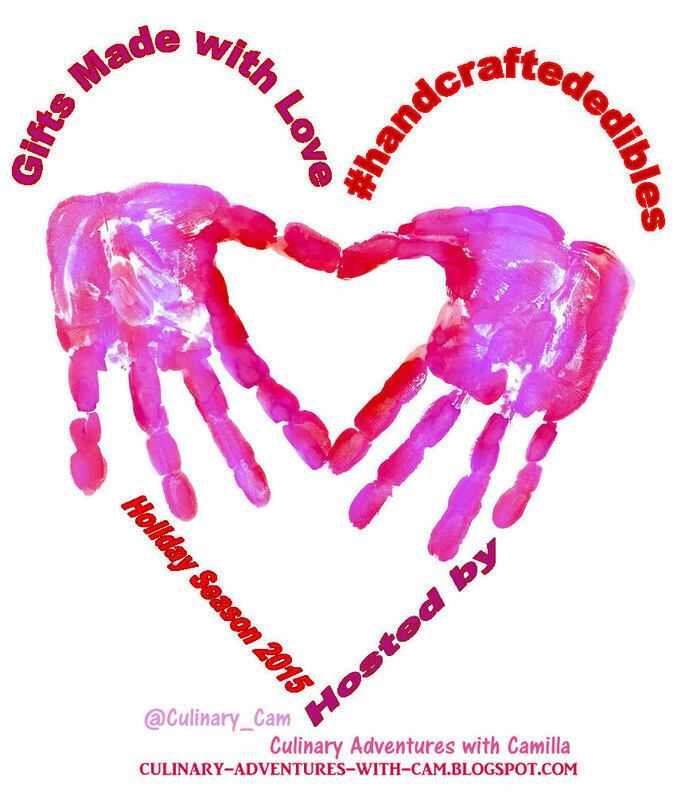 to share recipes for hand-crafted edibles. Over the course of twelve weeks, we'll be sharing recipes from adorable jarred gifts (last week's theme) to cookie platters and everything in between. Hope you'll follow along for inspiration. You can find out more information, including the schedule: here. I missed the first week of this party and therefore wasn't planning on participating in this week either but Camilla twisted my arm so I decided to make up some cocktail onions with a twist. I added some citrus flavorings to the pickling brine and then Frank used Citrus Vodka to create this Citrus and Spice and Everything Nice Martini. These little sweethearts would be perfect in a basket with a Martini Shaker and a couple of Martini Glasses for that hard to buy for couple that we all have in our lives. 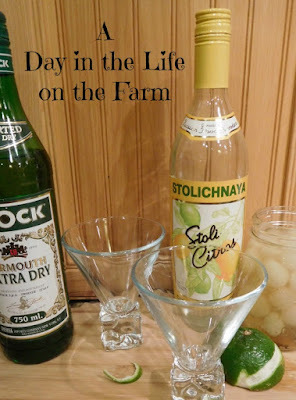 I am going to put them in a basket along with a bottle of Citrus Vodka and the recipe Frank created as a special gift to some special friends. This recipe will make 1 pint or 2 half pints of cocktail onions and will keep in the refrigerator for up to two months. Place the pearl onions in a pan and cover with water. Bring to a boil over high heat and cook for 3 minutes. Drain and immediately place the onions under cold running water. When onions are cool, cut off the stem end and holding the root end squeeze the onion from the skin. Set aside. It is the last Monday of the month. 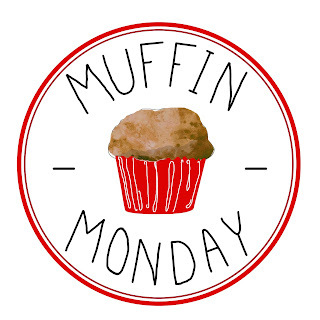 That means it is Muffin Monday, hosted by Stacy of Food Lust People Love. 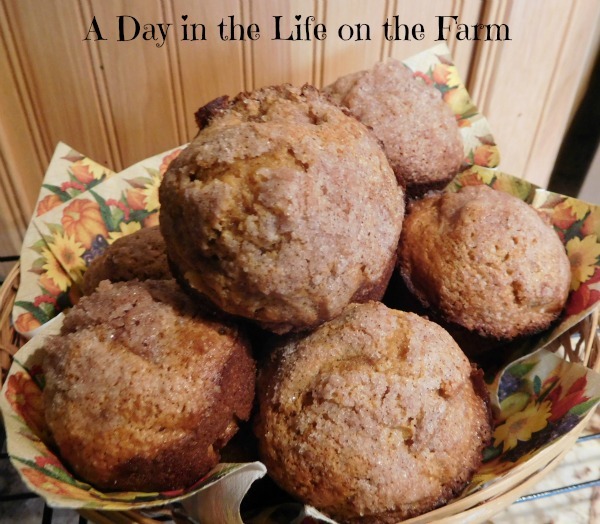 Each month a group of us get together and share our Muffin recipes. Muffins are a great, portable, compact food. Perfect for grabbing on the way out the door to school or work, for putting into the lunchbox or for a delicious and healthy snack for the kids when they come home from school ravenous. Today I am serving up muffins chock full of Fall Flavors because Fall is my favorite time of year and I'm enjoying it as long as I can. I served these up to the students in one of Frank's classes with coffee in the morning. They were a huge hit. Moist, tender and tasting of Fall. Combine flour, sugar, pumpkin pie spice, soda and salt in a large bowl. Combine pumpkin puree, egg and coconut oil (warmed to liquid) in a small bowl, mix well. Add the pumpkin mixture to the flour mixture and stir just until moistened. Fold in the apples. Divide into a 12 cup muffin tin lined with baking cups or treated with baking spray. Sprinkle with streusel crumbs. Bake in a preheated 350* oven for 20 - 25 minutes. Here are some more great muffins! This month for SRC I am assigned to my friend, Rebekah of Making Miracles. I was thrilled because I love Rebekah's blog. She shares her family and her life so openly. She has tons of great recipes and she truly does "Make Miracles" as she is a surrogate for those couples who cannot carry children of their own. Rebekah decided to become a surrogate after suffering a miscarriage of her own and realizing how devastating it is for people who want so badly to have a child but are unable to conceive or carry to full term. She has had 4 surrogate pregnancies, including one earlier this year which unfortunately did not go full term. Rebekah has blessed three couples with 4 baby girls though since one of the pregnancies resulted in twins. How selfless is it to carry a life within you for nearly a year and then give that precious gift to a stranger? God bless you Rebekah. Now Rebekah is in need of her own miracle. You see, last week, her 16 year old son, Kent, had a stroke while doing PT during his JROTC class. It was touch and go for a few days and now, praise God, Kent seems to be on the upswing. He is off all life support. He is alert and coherent. Kent has a great attitude which he will need because he has a long road in front of him. Kent has very limited movement on his right side and is not able to speak yet. But...he has sat up. He is participating in his therapy sessions. He smiles and gives big thumbs up when he is happy. God is good and so is Rebekah and her family. Please include them in your thoughts and prayers. Thanks...now back to Secret Recipe Club. 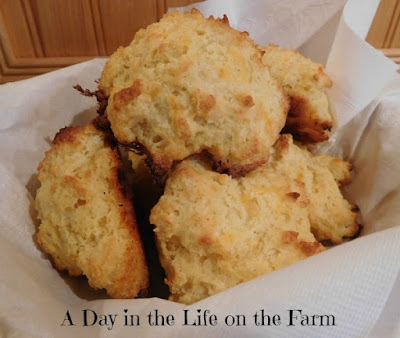 My favorite club in blogland filled with wonderful people and talented cooks like my friend, Rebekah. I belong to group D of the Secret Recipe Club. We are a big club with over 100 participants so we are broken down into 4 subsets. Each month we are assigned a blogger in our group and secretly look around their blog posts to find a recipe that we want to recreate. 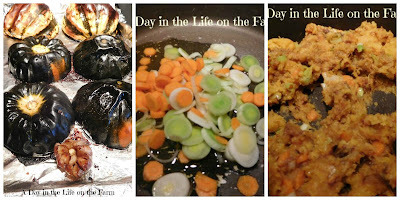 Then on the same day, we all reveal who we had and what dish we made. It is fun and if you would like to join us you can find out more on the Join SRC page. Rebekah has a serious recipe page, broken down into categories to make browsing easy for you. Since I am very familiar with Rebekah's blog and recipes and since I had just gotten a side of beef put away in my freezer, I went directly to the beef section. Rebekah does something in her recipe file that I have not seen any other blogger do. She marks the recipes that are her family's favorites and that she makes time and again. So when I saw this recipe for Pot Roast was marked as a favorite, I knew that I wanted to make it. 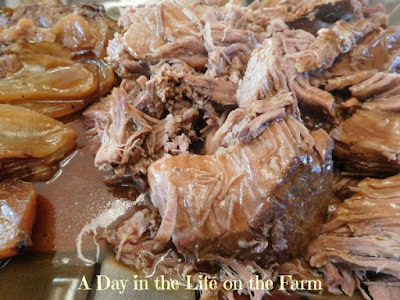 After all, you can never have too many pot roast recipes as you never know what ingredients you are going to have in your pantry. I made only one change to this recipe. I did not have a ranch dip packet but I did have an onion soup packet so I substituted that. This recipe, as Rebekah's name for it promised, is perfect and oh so easy. Thanks Rebekah. We are praying for you daily and anxiously awaiting your return. This roast was perfect. I made gravy with the juice. Just strain into a sauce pan and bring to a boil. Mix a little cornstarch with water and whisk it in. Cook and stir until thickened. It did not require any extra seasoning. I served roasted potatoes, carrots and brussels sprouts along with it. There were plenty of leftovers which will become Beef Pot Pie later in the week. Thank you Rebekah. We went to a new restaurant last night called Mulefoot Gastropub. It is a Farm to Table restaurant that gets the majority of the items they use on their menu within a 30 mile radius of their kitchen. They specialize in Michigan Beers and Spirits. They carry some Michigan wines but also have wines from other areas and countries. This is right up my alley and I loved it. Frank was not as enamored as I since they also use the nose to toes to tail ideal and that makes him shiver sometimes. Being the good sport he is he goes to all of these kinds of places with me and never complains. He first ordered a Crown Royal on the rocks. The server, who was very friendly and knowledgeable, advised that they had Michigan whiskey that would be used. Frank is very particular about his whiskey, so it was with some trepidation that he tried his drink and.....he liked it. The server told us it is Bill's Wheat Whiskey made here in New Holland, Michigan. I had a cosmo made with a Michigan Vodka and it also was very good. For our first course we shared the roasted garlic plate. Several cloves of garlic roasted a caramel brown and served with potted chicken rilette, pickled garlic scapes and homemade toast on which to spread it all. Delicious and I know what I am doing with my garlic scapes next Spring. My entree was the chef's special featuring Mulefoot Hogs for which the restaurant is named. It was Canneloni filled with braised Mulefoot head pieces and braised goat, served over a medley of seasonal. local vegetables. I loved it and was excited because I had been wanting to try goat. It tastes like beef when it is braised like this. I enjoyed a Malbec from Chile with dinner. Frank had housemade smoked kielbasa served with potato pierogi. He found his kielbasa to be too lean making it very dry and not to his taste. He did like the pierogi but they were served with a goat cheese sauce and he is not a huge goat cheese fan. He was disappointed in his meal but enjoyed the California Cabernet he had with dinner. For dessert, I had an apple danish served with bourbon ice cream and roasted figs. YUM!!! Frank had a Boston cooler made with ginger beer, bourbon ice cream and bourbon. It was very gingery and again, he was disappointed. It's okay though, Sunday we are going to the Polish Village Cafe for dinner after Dirty Dancing so Frank is happy AND he said that he will take me back to Mulefoot soon when he plans on trying the filet. 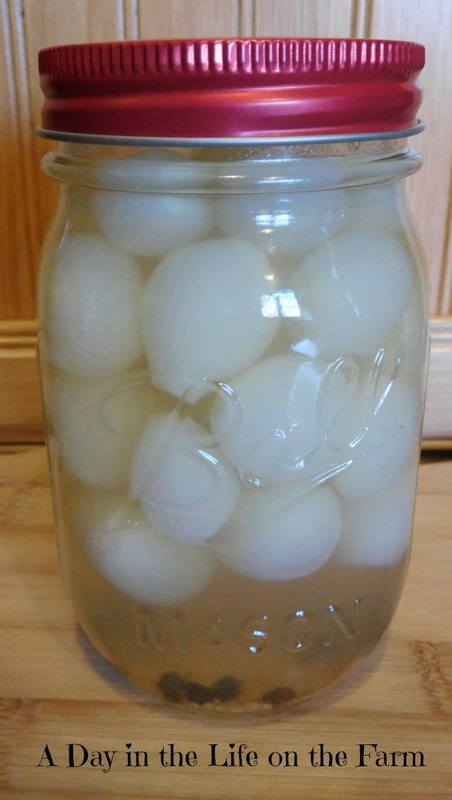 I pickled some onions earlier in the day today that I will be sharing with you on Tuesday for week 5 of our 12 weeks of Christmas #handcraftededibles. 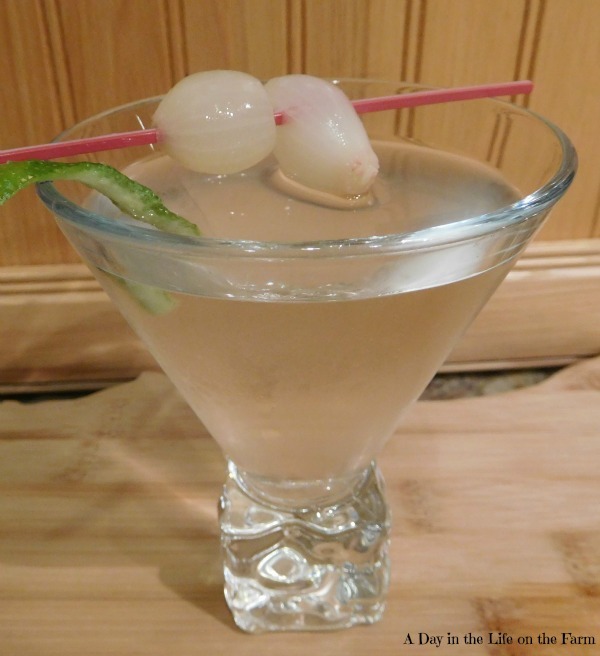 This inspired Frank to create a new Martini, garnished with the onions.